Smart financial decisions boost more than your bottom line—they'll make you healthier and happier too! Are you one of the 90% of people who are stressed about money? If so, you know it can take its toll on every part of your life. Financial health, physical health and happiness are profoundly interconnected. It's almost impossible to enjoy any one of these without the help of the other two. The authors describe this phenomenon as the intersection of money, health, and happiness. Leveraging Your Financial Intelligence will teach you a powerful values-based approach to achieving your most important life goals. As you take steps to improve your financial well-being, you'll discover that leveraging your financial intelligence will also fuel your physical and emotional well-being. Backed by the latest research findings in neuroscience, psychology, health, and cultural anthropology, the authors' invaluable advice focuses on the practical actions you can take to improve not just your finances, but your overall life satisfaction. You'll be inspired by meeting people from all walks of life who have leveraged their financial intelligence to build financial security, promote fitness and health, and increase their daily sense of happiness. Proven recommendations from the authors' work with countless clients, along with worksheets, self-assessments, and other tools will help you apply the book's concepts to enhance your own financial, physical and emotional health. 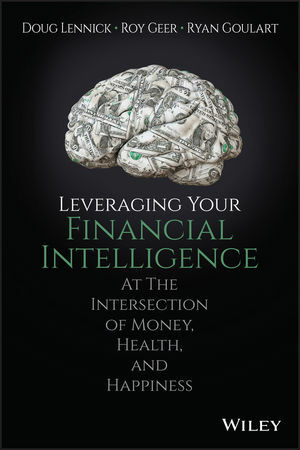 Use the strategies presented in this book to leverage your financial intelligence in a way that's tailored to your individual circumstances and allows you to create your own extraordinary intersection of money, health, and happiness. DOUG LENNICK is the CEO of think2-perform, a company that provides executive coaching, business advisory services and professional development programs. Doug is legendary for his innovative approaches to cultivating high performance in individuals and organizations. ROY GEER was co-founder of Resource Systems, a management consultancy specializing in corporate strategic planning and employee development. He later focused on coaching individuals and small teams in personal and professional development. RYAN GOULART is a Business Development and Research Associate, at think2perform. He gathers and assesses data from clients in order to assist think2perform in developing tools and programs that effectively engage audiences to meet client needs.